Giorgio Armani confirm in an interview at the presentation of the new Emporio Armani collection in Milan that he's designing Charlene's wedding dress. I wonder how it will look..
That's awesome! Honestly I could never see Kate pulling off wearing a dress by any of the upscale big name designers like Armani or Karl Lagerfeld, they would all look cheap on her. But I think Charlene will be able to pull it off. Clever choice really and she'll look swell in it. I'm sure Armani will put something swell together and Monaco is so international that she doesn't haev to worry about offending domestic designers. very very good choice...love his clothes, simple yet very elegant. She's going ot be a great princess for Monaco. Really, she'll fit right in, perfect to reign over the jet set principality. I hope the press gives her some wedding covers and wedding coverage. I think she'll be a beautiful Princess-bride. There will probably be only one new bride marrying a Prince, who will get to use the Princess title this wedding season and it's Charlene,NOT Kate, most likely Kate will be called Duchess. I hope! Good to see that Charlene is decisive enough, several months ahead of time while Kater-Tots is still dithering. Why do you like Charlene? She is exactly like Waity, she has waited for the ring without doing anything except playing princess when she was not one and having surgery done to look more similar to Grace. Even they both of them want to be like their dead mother in laws. And who was she going to choose as designer but Armani? She has been given freebies all the time in case she got the ring. ^Yeah, I thought she was better, but when I actually looked her up, she's just a prettier WK that's already had diplomatic gaffes. Charlene has been in the Olympics, nothing small to sniff at. Something there. Has anyone read her last interviews? She is stupid and it shows. Monaco is going to the dogs. These days it sounds like all royal houses are going to the dogs, with the exception of the non-reigning houses. Pity that the nation's reputation is determined by the whims of a bunch of boys. As for Monaco, Albert is older than William and given the mess he's made of his life, has a lot less options. Finding a woman without children and no previous marriage is quite the catch, especially for a Grimaldi. Two, maybe three kids out of wedlock is, when you think about it, quite the load of baggage for any woman to be taking on. Albert is quite lucky to have a woman minus all of that, plus willing to take on Albert's love kids as well as having her own. I think that's why I'm so fawning. It's not like the other royal families have much to do with the Grimaldis anyway. Grace was possibly dim but she knew how to make Monaco the it place. Charlene only brings more trashiness to the land of trashiness. I recommend everyone to read more about her, maybe some of you will like Waity a bit more. Alexandrine and Ella - I sort of agree, now, about Charlene. Although , in pictures, I did think she looked MUCH better than KM, and although Charlene exudes PHYSICALLY some semblance of stateliness/sophistication, I do NOT believe INTERNALLY or INTELLECTUALLY she does. 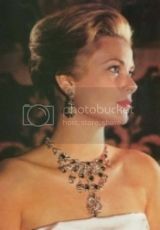 I never really liked the Monaco group, except for Prince Rainier who seemed smart and regal, but Princess Grace seemed all LOOKS and no smarts IMO. She was very ladylike, though, and as an actress I suppose she played her roles well, seeing that those roles were of pretty, simple feminine blondes and NEVER string smart women, like Katherine Hepburn, Joan Crawford, Audrey Hepburn. I thought Princess Caroline looked very pretty when young, but for the last 15 years os so, looks horrible. Charlene does, however, seems like the glamorous type who will make Monaco sparkle and I believe THAT is what Prince Albert wants PLUS that HEIR ! LOL. Alexandrine - I would love to read more about Charlene, but I really cannot find anything THAT bad. Am I not looking or googling the right words ?? I agree. I like that Charlene was pursuing her Olympic dreams, living her life. Represented her Country in the Olympics, it does show discipline. I also like that she has spoken a bit of French in a interview and she looks very polished, she is slowly rising to the challenge put before her. Whereas Kate appears to still be in University mode, like she's trying to be a teenager when she's almost 30. I also like that Charlene does not have a stage Mother(Carole) she doesnt have an entire Family pushing her to pursue a Prince. She met Prince Albert and the two have dated , her family has not jumped into pushing the relationship on a regular basis. I think Pr. William is a 28 yr old boy, who was pursued by an entire vampirish-family, he was lamb to Middleton's slaughter. Kate and her family turn me off completely. I like Charlene I don't see any problem with her, she was an athlete, she went to the Olympics, she had Charities even before meeting Pr. Albert. It's Kate who IMO, basically set out to bed and board a rather sexually-inexperience young Prince, who hides behind her family under the press veil of a nice family girl , who I find trashy with all her crotch shots. I have no problem with Charlene for Pr.Albert with his ton of baggage. Charlene makes Pr.Albert look good imo.